Looking back through October posts from previous years I noticed a theme...............conkers/horse chestnuts; leaves and mushrooms. October in Normandy is special to us because that's the month, 21 years ago, that we moved into this old house. 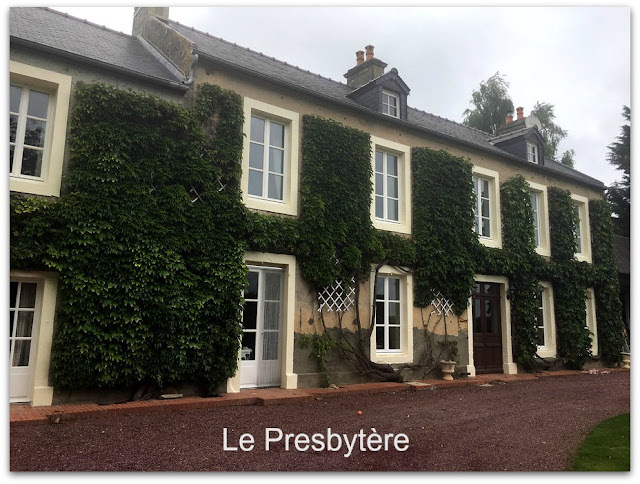 The Virginia creeper that covers the front of the house is green no longer. It seems that almost overnight the leaves have turned a million shades of red and gold, they remind me of how the house looked the day we drove up with the removal van close behind. The horse chestnut tree in the back garden has once again, true to form, literally covered the grass with fallen leaves and conkers. I brought some indoors to display in an antique pewter dish on the hall table. After a couple of days of back breaking raking and wheel barrowing the Senior Partner and I called it a day because today our brother in law and nephew are travelling from the UK to help us get the garden sorted before winter arrives. Hopefully the weather will be kind to us as we'll need to have a garden bonfire before they leave. There are also plans to empty one or two attics of unwanted possessions junk, the garage space will be getting an overhaul too, if time allows. A large white van has been rented, they'll collect it in the morning, to take everything to the dechetterie (recycling). We're also expecting deliveries of gravel for the driveway and pine bark mulch for the flower beds. It's going to be a very busy week, hopefully I'll have some photos to share next time. A selection of fungi found growing at the bases of trees, in the grass and also on the compost heap this week. Although they look pretty harmless some of them might not be so the closest I got was to capture them with my iPhone, they will not be making an appearance in the kitchen! 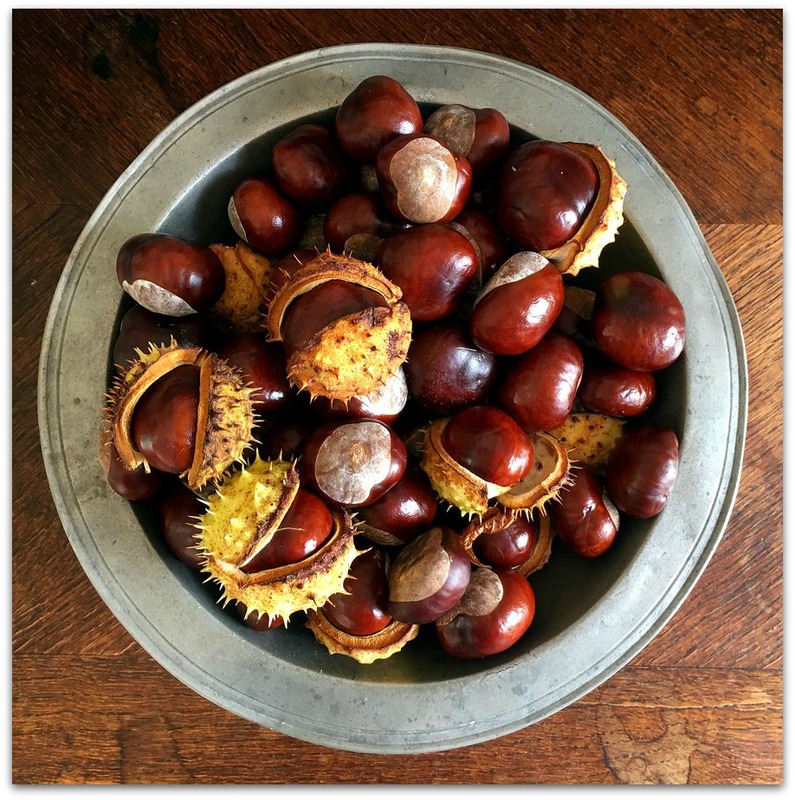 Wish we had a sweet chestnut and not a horse chestnut tree in the garden, at least then we'd be able to eat them. 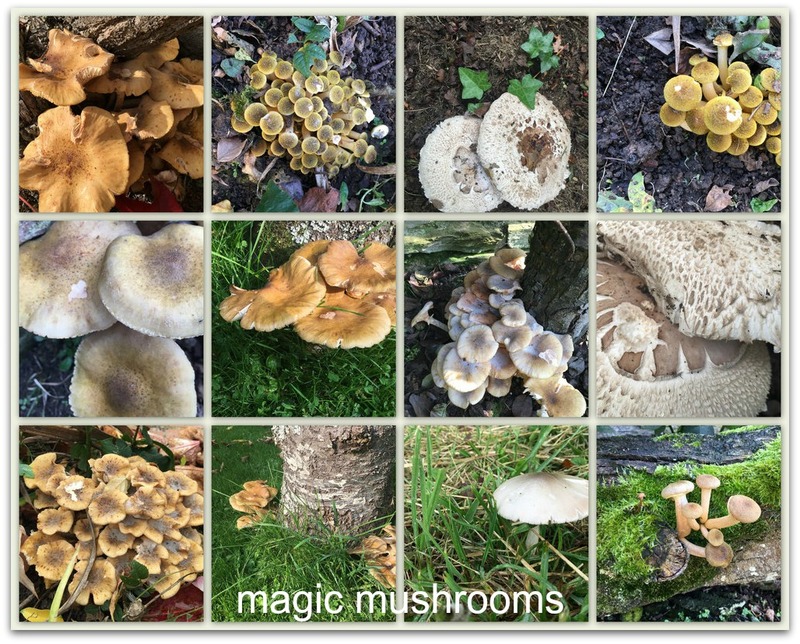 Wonderful photos - love all the mushrooms. A garden party to clean and get things organized - what fun. It is nice to have family to help. Love the photo of your home. It must be so special to live in such glory. Love seeing the outside of your home and then the wonderful fall colours. Such a lot of work to get the home and yard ready for winter. Thank you Maggie for sharing pictures of your life, always appreciated. 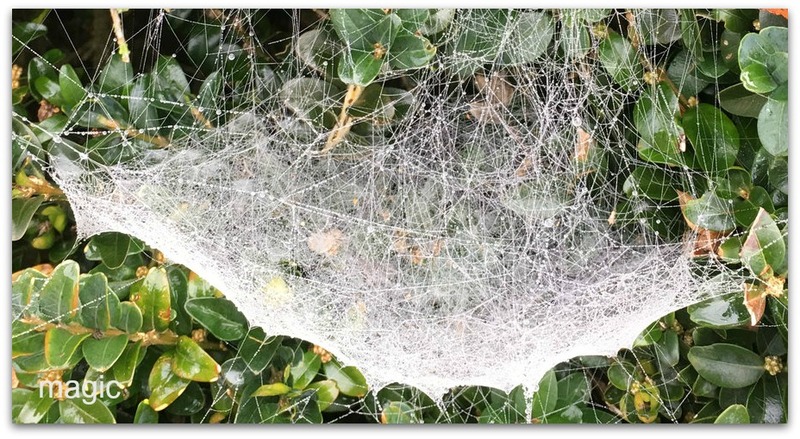 Wonderful images of the fungi, and that spider web - magical, indeed! Good luck with your busy week of sorting out and organizing. Your house is so pretty. I can imagine that with the autumn colour, your home is even more attractive. 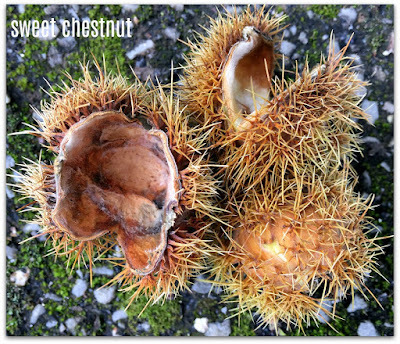 When I lived in Brooklyn, NY, a nearby neighbor had a giant horse chestnut tree in front of their home. It was very rare as most of those trees were wiped out in NY with some sort of tree disease or beetle. It was a beautiful tree--flowers in spring and conkers in fall. I enjoyed seeing all the different fungi and spider webs that you found. They are all so unique. I thank you wholeheartedly for another stunning post of yours, sweet friend ! Looks like a lovely old house. You can keep the mushrooms. and I don't know if I have tasted chestnuts. 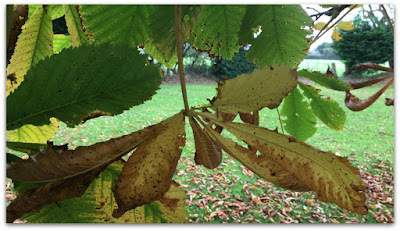 Have a fabulous week and enjoy the remainder of October and thank you for the link up. Hi Maggie! Wow- that's an amazing home! October is a wonderful month, I agree whole-heartedly! Thank you for hosting. I am so excited to share a mosaic with you today. Have a blessed and wonderful week. Your house is perfectly lovely, Maggie! So are the mosaics of autumn leaves and fungi. I’m marveled at the lacy cobweb, intricate nature’s art. Thanks for sharing. Wow Maggie, you've really captured the beauty and abundance of nature in your garden! Spider webs are always magical, and these are wonderful. Good luck with the clean up party....we have the theory that stuff in outbuildings breeds when we are not looking!!! It's lovely season, Maggie, and you have distilled the essence of it with your photos! Hi Maggie, It's a busy time for you! I enjoyed seeing your magic garden. Happy Home-versary! You live in such a beautiful home...so rich with history. Hope you get everything done this week that you have planned...sounds backbreaking! Hope you can supervise and not over do it! Happy MM! Hugs! I so enjoyed reading your post, today, and seeing your beautiful home for the first time; I must look for previous posts that you may have done on it. 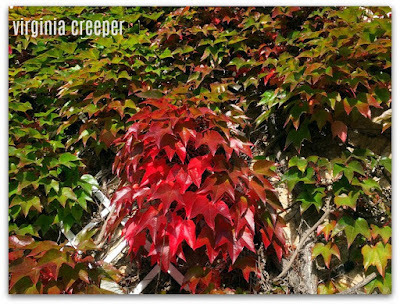 The Virginia creeper, in all its copper-y red hues, is so pretty! 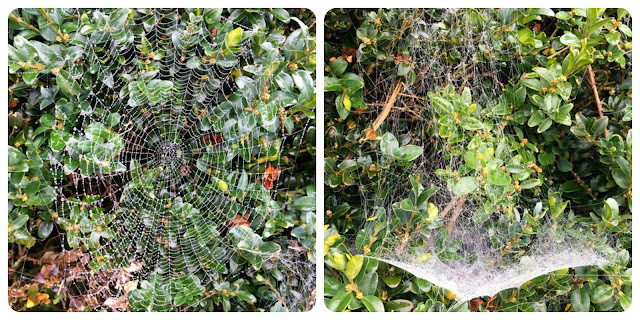 How romantic/French country it all looks: the vine, the chestnuts, the fungi and yes, even the spider webs! I'm sure that once you and your husband and your visiting family apply their expertise and helping hands, it will be perfectly prepped for the season. Well, after a super busy summer, I am looking forward to devoting more time to my blog, as well as visiting all my friends. Thanks for hosting, and Happy Autumn! Your home is so beautiful, Maggie. And I love all the natural things you are finding nearby. Fungi always intrigues me -- this is great! The chestnuts may not be edible, but they are absolutely beautiful in the pewter bowl...or on the ground (for those of us who don’t have to rake up anyway). I do love seeing your beautiful home outside as well as in....lucky to have loved ones to both visit and help with those big projects. As always, many thanks for hosting. Maggie - I am not sure I have seen a full picture of your house before - what a beauty!!! 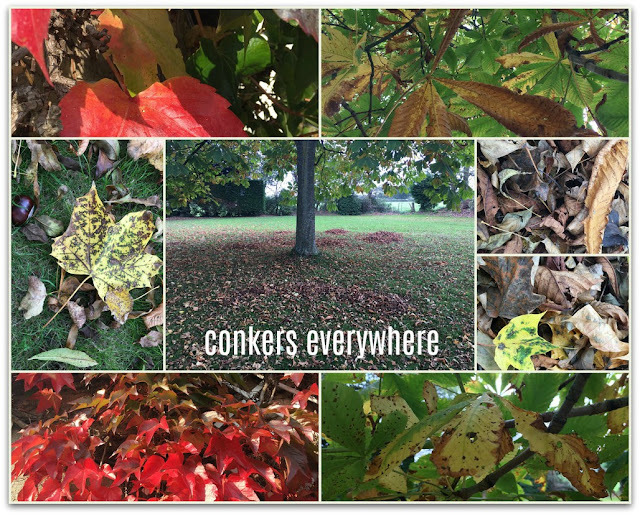 My husband has very fond memories of playing conkers with the conkers, since he is from the UK. He wishes he had even a few from your garden! I hope you have a wonderful visit with family, and that your to-do list is done! Thanks as always for hosting! I love your mosaics! The last picture is awesome.